Chimney Tops is one of the more popular destinations in the Smokies because of its central location, rugged beauty, and challenging access. And challenging it is. While short in distance, the trails that lead to the summit of Chimney Tops are steep and strenuous. Accessible from two trails, one below that climbs from Hwy 441 to the top, and one above that drops down from Clingmans Dome Road to meet the other. It was this latter, known as Road Prong Trail and formerly Indian Gap Road, that we chose for our adventure to Chimney Tops. We discovered a stunning forest along the Road Prong drainage, but the hoped for views from Chimney Tops were dashed by the seemingly ever-present Smoky Mountains rain clouds. Ken and I took this path on Wednesday, August 19, 2015 from 8:30AM to about 1:30PM. Our plan was to drop down the Road Prong Trail to the junction with Chimney Tops Trail, then climb to the summit. The planned return was back the way we came. Sometimes plans don’t work out. Hike Rating: Difficult. Very strenuous plus extremely rugged terrain. Trail Condition: Road Prong Trail is rugged backcountry. Very rocky and rooty with slips and trips very likely. Several creek crossings, including hiking in the creek for a few hundred yards. The Chimney Tops Trail is outstanding. Starting Point: Parking area for Road Prong on Clingmans Dome Road. Trail Traffic: We encountered no other hikers on Road Prong Trail and about 50 others on Chimney Tops Trail. How to Get There: For Road Prong trailhead, from Cherokee, NC or Gatlinburg, TN take Newfound Gap Road (Hwy 441) to Clingmans Dome Road near the state line at Newfound Gap. It is approximately one mile up Clingmans Dome Road on the right to the parking area and trailhead for Road Prong. The trailhead for Chimney Tops is located roughly 6.9 miles south of the Sugarlands Visitor Center on Newfound Gap Road, between the lower tunnel and the loop. I’m sorry I don’t have the normal interactive map here, but my GPS failed to track on this hike. The Road Prong trailhead is found on Clingmans Dome Road, about a mile up from Hwy 441. Look for it on the right. There is enough parking for at least a dozen cars. Traffic of all sorts once passed through here — Indians, explorers, Confederate soldiers, farmers and livestock herds, and traveling families. This location on the crest is known as Indian Gap. Road Prong Trail follows the path down Road Prong drainage formerly taken by Indian Gap Road. At one time this was the major north-south passage through the Smoky Mountains. For centuries this had been an Indian trail, but in the 1830s it was widened as a toll road for pedestrians, vehicles, and livestock. The new road was steep, rocky, rutted, and only about five feet wide — much as it remains today, at least the steep, rocky, and rutted parts. Until Newfound Gap Road opened in the 1930s, travelers had no better way to cross the Smokies. These days the path is a single track trail known as Road Prong and is only accessible to hikers like you and me. It descends a total of 3.3 miles, to the Chimney Tops trailhead far below on Newfound Gap Road. 2.4 miles below, though, it meets the Chimney Tops Trail for a steep climb back up the other side of the drainage. That was our goal. There was a 50/50 forecast of rain on this day, very common in the rain-forest-like conditions of the Smoky Mountains. There was a hint of blue sky with puffy clouds as we arrived at the trailhead. Perhaps we would get the lower 50. While putting on our hiking shoes and packs it suddenly changed, as the breeze brought in a gentle mist. So on went the rain gear too. Only a few minutes later, after we had stepped into the forest, we could hear larger raindrops striking the tree canopy above. Road Prong Trail begins a steep descent immediately. There’s no warming up here; it’s just down, down, down for the next 2.4 miles — approximately a thousand feet change by the time it ends. The forest is simply beautiful; filled with the delightful aroma of high country spruce and fir, seemingly every moss and lichen known to man, and a wide array of summer wildflowers including rudbeckia, jewel weed, and turtleheads. It is also filled with rocks and roots. Especially with all the moisture, Road Prong Trail is difficult to navigate. There is a constant need to pay attention to every footstep to avoid slipping or tripping on the exposed, wet obstacles. And it is dark. The overhead canopy is very dense, preventing much light at all from reaching ground level. The foliage does a remarkable job with this limited light. Everything had that clean, fresh look of wetness. About a mile down the trail you’ll begin to hear that tell-tale sign that water is near. Tomahawk Prong comes down from the south to meet Road Prong and the combination makes for a larger, and noisier, creek. Over the next mile and a half, you will cross that creek several times, each succeeding one getting wider and more treacherous. At one point the trail has become so blockaded by blow down that you actually have to hike in the creek for a few hundred yards. Hopefully you remembered to wear your waterproof shoes. Just take your time, and watch every step. The rocks are not only slippery, they will also roll out from under you. This is the kind of challenge that makes hiking so exciting. After all, we wouldn’t be Meanderthals if we stayed on dry dirt all the time, now would we? Road Prong now begins to descend Sugarland Mountain in earnest, becoming a long series of falls and cascades. At times, the trail stays alongside. Sometimes it has to climb above the gorge to find a foothold. This roller coaster section is truly rugged terrain. As if it hadn’t been gnarly enough already, you will find yourself stepping around, over, and off of boulders and canted rock shelves. Your groin and glute muscles definitely get a workout as you stretch, then stretch more to find the next secure footing. There is a reward for the hard work as you eventually get near the prong again and have several opportunities to access the picturesque falls and cascades. I always love the sight and sound of whitewater. It is fresh and invigorating. It is cleansing and purifying. It is what makes the Smokies so special. It seems as if the national park is one massive watershed. After about two miles, Ken and I reached the most difficult looking creek crossing yet. It was time for a break. We found a nice log to sit on, pulled out a snack, and studied the map to see how much farther to Chimney Tops Trail. By this point I was already beginning to dread the climb back up this trail. While enjoying the rest, we picked out what looked to be the safest place to cross. When it came time to move on, our choosing proved fruitful as we were both able to make it successfully across without a mis-step. Ken checks the map while we rest alongside Road Prong. The final quarter mile down Road Prong you get a bit of a respite. The trail widens, is mostly dirt now, and is surrounded by luscious greenery. We topped a little rise and could see the Chimney Tops Trail crossing just ahead. The downhill was finished (for now), and it was time to change the mindset to climbing mode. I paused to shed the rain gear and stow it away in my pack. While doing so, other hikers coming up from the north on the lower section of Chimney Tops Trail passed by, including a very friendly couple from Massachusetts who would prove to be very instrumental in the rest of our day. The National Park Service rates the Chimney Tops trail as moderate in difficulty. It must be because of the short length because there is nothing moderate about the climb that you are now facing. In the next 1.1 miles the trail gains 960 feet. If you’re an experienced hiker, you know that anything over 700 feet per mile is pretty darn steep. I’ve been having difficulty with my stamina this year, and for me, the next hour proved to be brutal. It starts out innocently enough, twisting over graded dirt, but then you reach the stairways. In 2013 and 2014 a Trails Forever crew sponsored by Friends of the Smokies completely rebuilt the Chimney Tops Trail. Because of the popularity, over decades the trail had experienced significant wear and tear and erosion. The wonderful maintenance crew did a remarkable job of restoring the trail including installation of a total of 367 stone steps, and countless other water bar stairs. The work they did with erosion control is incredible. Bravo! For me, all those stairs were killer. Take a look at the photo at the top of this post to see what I mean. During the many pauses I took for a breather I had plenty of time to study the amazing construction work done by the team of Trails Forever folks. Particularly through moist and damp wetland areas, these improvements were built to last. Despite my fatigue, I was able to relish the wildflowers that line the trail, and the old growth tulip poplars that dominate the landscape. It was at one of these rest breaks where I stopped to chat with Liz and John, the couple from Massachusetts. This was their first time to the Smokies and they had been enjoying the exhilarating forests, streams and mountains. I made a few recommendations for other trails to explore on the remainder of their trip, and then I popped the question. By now, I was really struggling, and I knew from a previous visit to this trail in 2007 that it didn’t get any easier. It remains steep the entire way up. I came to the realization that I would not be able to make it back up Road Prong to Clingmans Dome. So I timidly asked John and Liz for help. 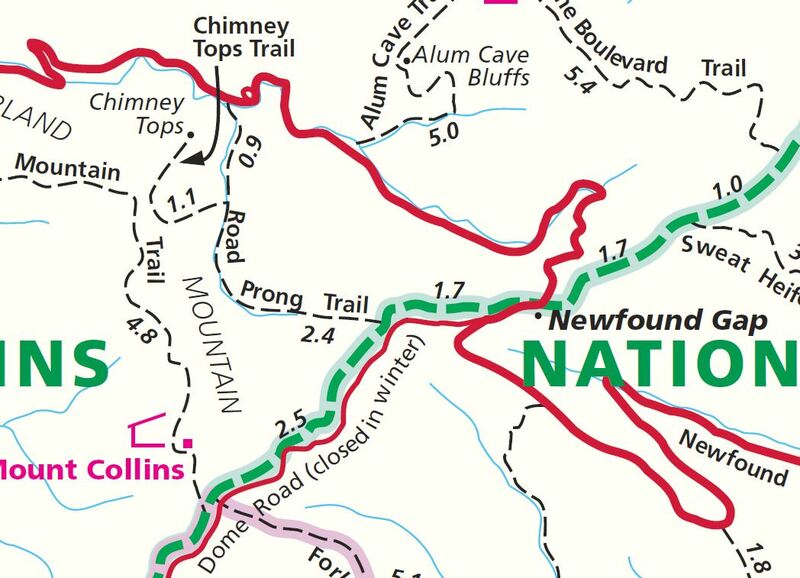 If Ken and I finished when they did, would they be willing to give us a ride from where they parked at the Chimney Tops trailhead up to Clingmans Dome Road? When they graciously agreed, I took the most relieved breath of air I’d had in the last 30 minutes. Ken had already gone ahead, and Liz and John now also continued the merciless climb. Meanwhile I plodded along, but I kept with it. I paused frequently for a breather, but I somehow made it to the plateau at the base of the Chimney Tops pinnacles. There is a fantastic view of the south pinnacle through the trees and I could see some tiny specs of people climbing like ants to the summit. I took a few photos, and little did I know at the time, but those specs were Ken and John. John and Ken climb the very treacherous south pinnacle of Chimney Tops. It was also about this time that the clouds opened up and released a very typical Smoky Mountain rain shower. I dug out my rain gear again before proceeding to the base of the pinnacle where I found Liz trying to stay dry. We compared notes about the conditions while waiting for John and Ken to return from the summit. It didn’t take long as they did not want to be caught up top in this storm. After decades of wear from hundreds of thousands of hikers, the rock that makes up the Chimney Tops pinnacles has been worn extremely smooth. It is slick enough in dry, sunny weather. It is a beast when it rains, therefore Ken and John’s very careful descent. 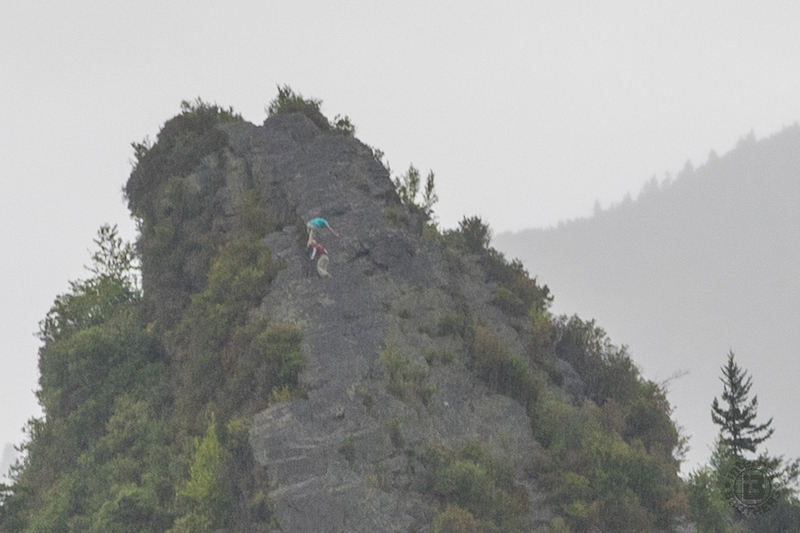 As much as you may want to after all your work to get there, please don’t climb the pinnacle when it is wet. It is an accident waiting to happen… a bad accident. The four of us found some nice rocks to sit on and enjoy lunch while swapping hiking stories. John and Liz do most of their hiking in the White Mountains of New England, and we discovered that they and Ken shared a recent experience of hiking rim to rim in the Grand Canyon. Unfortunately, everything was socked in low lying clouds, so I couldn’t get any panoramic photos of the surrounding landmarks, including Mt. LeConte, Anakeesta Knob, and Mt. Mingus. Hopefully the cloud photos below will suffice. While we were hanging out at the Chimney Tops plateau at least two dozen other hikers came and went. As I’ve said, this is a popular hike, even on a rainy Wednesday. You might want to skip this one on a sunny weekend. After some more photos it was time to begin the descent. Ken now agreed that it was not in our best interest to try climbing back up Road Prong, so we stuck with John and Liz for the descent back down Chimney Tops Trail. They are both very strong hikers. Liz had the shortest legs among us, and I found it a challenge to keep up with her rigorous pace. We passed the junction for Road Prong, continuing downward instead, and I took a deep, contented breath. Not long after, another rain shower hit, this one the hardest of the day. In this last 0.9 mile stretch of the trail to Hwy 441 there are three footbridges over the West Prong of Pigeon River. This was another remarkable accomplishment of the Trails Forever maintenance crew. In fact they had to build one of the bridges twice, as it was taken out by a flash flood during the project. I wanted to take some pictures but it was raining so hard it wasn’t possible. This is the only one I was able to get of West Prong. We arrived at John and Liz’s car in the pouring rain and loaded up quickly. Words cannot express just how grateful I was for the kindness they shared by taking Ken and me up the mountain to Newfound Gap and Clingmans Dome Road. It took us a full two hours just to come down Road Prong Trail. In our fatigued condition I was imagining as much as four hours to get back up. I don’t think I would ever want to go up Road Prong no matter the weather or stamina conditions. When we arrived back at my car at the Road Prong trailhead we said a fond farewell to Liz and John, wished them the best for the rest of their Smokies vacation, and promised to keep in touch. Thank you! Thank you! Thank you! So let’s summarize. This is a hard hike no matter how you look at it. The descent of Road Prong is very taxing with all the obstacles and creek crossings. The ascent of Chimney Tops Trail is exhausting, so you better be in pretty darn good hiking shape. Moderate indeed. I tend to disagree with the NPS. 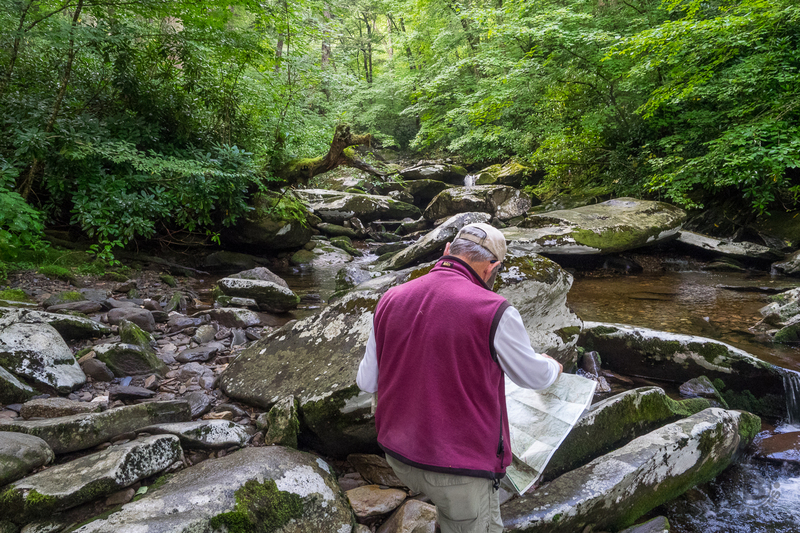 You may want to consider this as a shuttle hike, positioning one vehicle at the Road Prong trailhead and another at the Chimney Tops trailhead like it worked out for us. 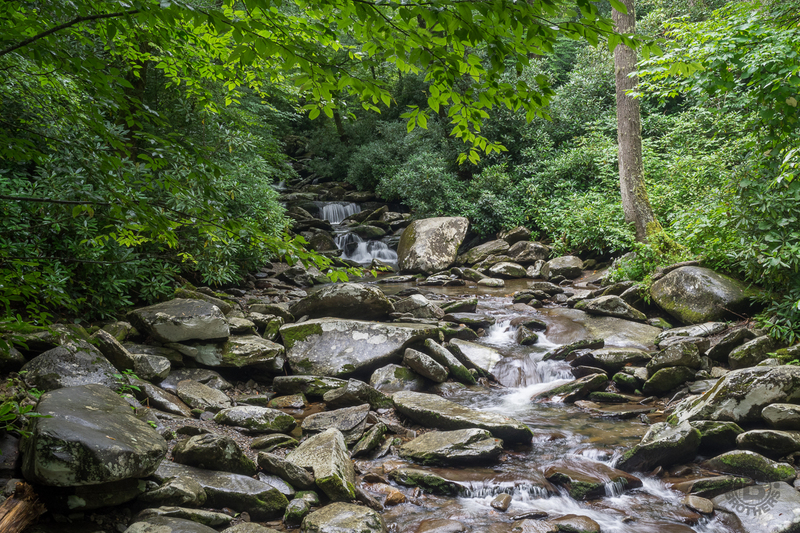 Otherwise, it is a beautiful hike, combining the forest, water and vista features that the Smoky Mountains are known for. Update April 16, 2019: I took the opportunity of a visit from my brother to shuttle hike Road Prong Trail. It was every bit as steep going down as I remembered. Also, you still have to walk the creek for a couple hundred yards about half way down. I even got a little drenching from a slip. No harm. The one major crossing is still there too, and was somewhat treacherous following the recent heavy rain storms. 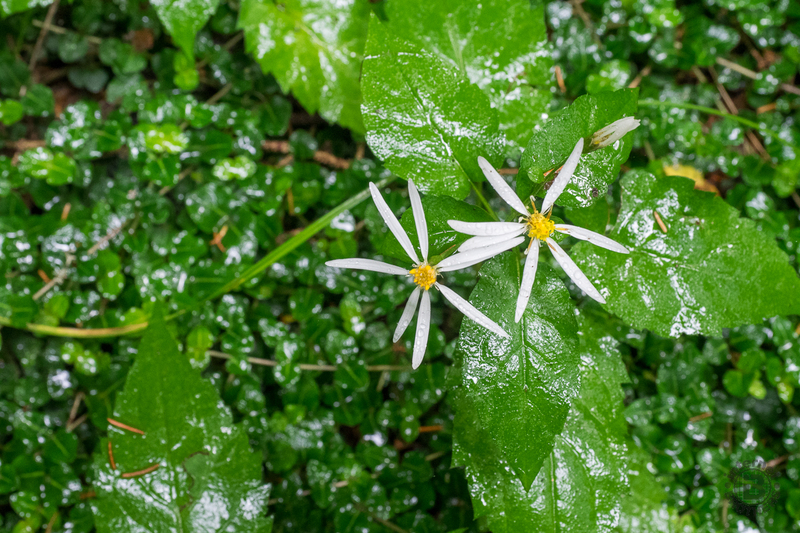 Following are some new pictures, including several of the variety of spring wildflowers that inhabit Road Prong Trail.